At the VADA/Nova Breeding Classic and Summer Dressage Warm-up, at Morven Park, Fabuleste won high point of the horse show with a score over 75% from two different judges at Tr. lvl 2 and 3. She was so well behaved at her second horse show ever, scoring several 8’s for her canter work. Updates on Guess and Fab. Took some pix of Beste Guess schooling in my ring July 16 a.m. He has on his Jessica Ideal saddle and his Hastilow pad and ear bonnet. I love the bonnet – it fits my horses OVERSIZED ears! 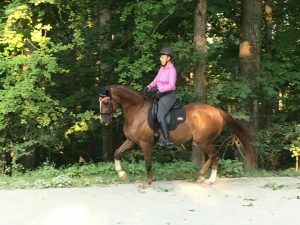 Guess keeps getting stronger and is improving with his pirourettes and tempi changes. He can consistently do his 4’s. 3’s and up to five 2’s. That is all I have asked for to date. I love photo 6 and 7 as they really show engagement and reach! Guess keeps getting better and better and I am delighted with his progress since he is only 8 years old. I hope to show him PSG in the fall. Guess has gotten bigger and wider and we just moved into a wide saddle from his previous MW. Thanks ANNETTE, for helping me keep him fitted with the best saddles. The other pix are from Fabuleste at her show in June where she won high point Training level and high point for the entire show on Friday. Even tho she is a full sister she is much bigger (17.1) than Guess (16.1) and being just 5 years old, she is still learning to balance herself. Currently, she is working on leg yielding, lengthening in the trot and canter and simple changes through the trot. I have introduced shoulder in and smaller circles and raised trotting poles. She also continues to get better. She might prefer a longer frame and flatter stride but she is really starting to listen to half halts and show some balance and self carriage. It will be fun to see how she improves this summer and fall. I attended a Judge’s Forum in Lexington Va July 13 amd 14 and I also had a student who competed in the GP and GPFS, so it was a busy weekend. About 20 judges attended the clinic and we got to watch and discuss all the levels from Training to GP. Dressage is a great sport and one where you never achieve perfection. Many riders scored from 3 -7 or 8’s in the same test. 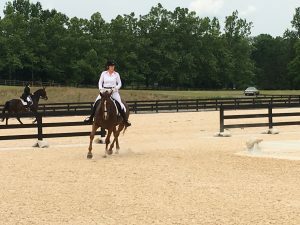 There is always more to work on and it is an amazing and rewarding experience to be both a judge who desires to help riders improve and a rider who desires to improve herself. I totally get how much effort goes into getting ready for a horse show. This week I travel to NY to judge. Then it’s off to Seattle Washington and the following week to Colorado. I have to work hard to keep my horses fit and in proper training but it seems to be working. Annette Gavin, from Hastilow Saddlery, just reflocked both saddles for Guess and Fab. I was happy to hear her say how great Guess’s trot looked. She saw a big improvement from last time. Also, Fab needed the tree widened in her saddle. She is growing and changing shape too! My son, Seth, came up from Texas. We went on a trail ride and he really liked riding in the saddle on Fab. YES, I trail ride in a dressage saddle. it is comfy. Our trail rides are pretty leisurely! Annette left me with some new reins to try. So far, I really like the leather rein with the rubber backing. Follow Heidi on Facebook. We’ll be adding news and updates there as well. I have really been busy this year traveling to Washington State, Ohio, Wisconsin, Texas, New Jersey, North Carolina,Virginia and Georgia. Judging helps my riding and riding helps my judging and teaching. I feel honored to be asked to to judge at so many different shows and meet people around the country. 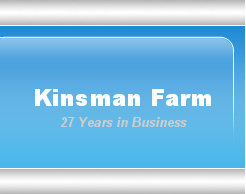 I have really enjoyed picking up some super new students and I always love teaching my long-term clients. One son, Seth – age 23 – has graduated and Beto is a senior. So my time is freed up and I have some wonderful dedicated students who are competing at 2nd lvl – GP. Guess’s 3 year old full sister is already 17.1 and has been ridden for a couple months. I am really pleased with her progress. She has been on multiple trail rides and crossed lots of streams. The first time was a little challenging but now she is a trooper. It has been interesting because I am trying to find a saddle that fits her while also getting used to riding a youngster. Guess qualified for BLM and GAIG at 2nd level and then he and Heidi concentrated on perfecting the flying changes. Heidi worked with Linda Zang at multiple clinics and Guess is definitely getting the concept!!! GAIG Show Results, Lexington, VA.
Heidi recently competed Beste Guess at the GAIG show in Lexington. In March (2015), Heidi attended a mandatory Dressage Clinic with Gary Rockwell and Katrina Wurst in Wellington, FL. The clinic was packed with information and was one of the best clinics she has ever attended. She stayed an extra day for an extremely informative Dressage Freestyle Seminar. Heidi has been busy judging in Florida, Iowa, and Northern Virginia. In the next couple months, she will be judging in Washington State, South Carolina, Maryland, and Minnesota.